Dinner should be a place where tasty memories are made. 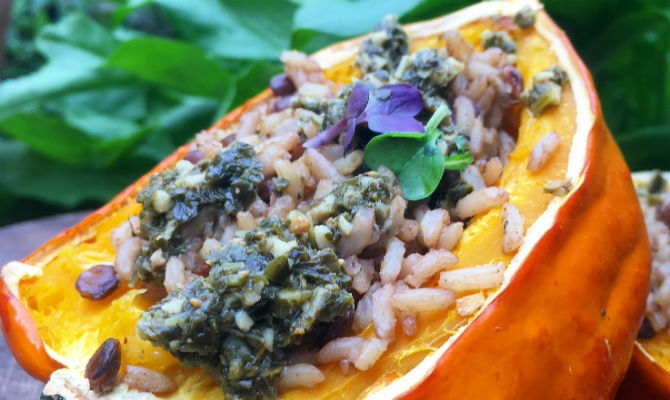 We can help you start making your memories with this amazing stuffed acorn squash! Pumpkins and all different sizes of squashes, falling leaves, and changing seasons mean our bodies are craving more hearty and filling dishes. Food in itself has a different personality that communicates with us on many different levels. It provides pleasure, nostalgia, and memories. This is the time of year where memories are made through familiar tastes and dishes that bring family together and fill our tummies during fall and thanksgiving. This dish is perfect if you have any vegetarians or vegans attending gathered dinners. This recipe is gluten free and vegan. This dish is filling and will keep you full the entire day. We use brown rice and lentils to fill these delightful mini squashes. Top it with a fragrant pesto, and you have yourself a heart filled meal that will leave you wanting more. You can make a big batch of these little squashes and pop them in an airtight container. They will last 2–3 days in the fridge, so they’re a perfect leftover food. Another great option for butternut squash is to make the sweeter version by slicing it in half, drizzling a touch of maple syrup, cardamom, and cinnamon. When it’s finished cooking, you have yourself a delicious and sweet treat that not only healthy but guilt free. Cut the squash in half and scoop out the center. Drizzle with olive oil and Himalayan salt. Once the acorn squash is done cooking, stuff with rice and lentil mixture. Top with pesto and serve. Are you seeing weird numbers and letters? Find out why here! 20 Delicious Vegan Thanksgiving Recipes To Make Your Holiday Easier!